The Great Spring Greenhouse Sale is on Now! 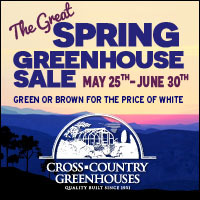 Backyard Greenhouses is pleased to announce that The Great Spring Greenhouse Sale has begun! Purchase a greenhouse before June 30, 2015 and receive a free paint color upgrade to dark brown or forest green. If you prefer the greenhouse be painted white, receive a discount of up to $300.00. Want to paint your greenhouse a custom color -- enjoy a 50% discount! Some exclusions apply as noted below and the color discounts will only be applied to greenhouses or lean-to greenhouse models purchased before June 30, 2015.